SITETREE, very handy, shows all, keep one open. FREE Real Color Wheel to print out link. This course teaches the principles of accurate drawing and painting techniques on location. This course is all about color and the "Real Color Wheel". Mix shadow colors with opposition colors. These paintings show the full range of neutral dark pigment colors. They are made with true complementary colors, instead of opaque pigment black. My "Real Color Wheel" matches pigment and light, perfectly. 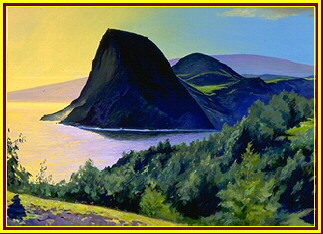 Please visit my gallery to see scenes of Maui painted with this palette. Go to this 'End' page, it's all linked backward from here, click the previous button to see my latest painting with painting tips. In the Computer Coloring Book, each original drawing was produced on location, from Maui scenes. Free Down load to paint with pattern outlined images. FOR ARTISTS, PIGMENT COLOR AND ITS HISTORY. AND PAINT REALISTICALLY, IN DIFFERENT HISTORICAL TECHNIQUES AND MEDIA, ON LOCATION. GLUE, EGG, MASTIC, FRESCO, CASEIN AND OIL. PLUS TIPS AND TECHNIQUES IN ACRYLIC. PAINTING MEDIUMS FROM THE DARK AGES. DON'T MISS "CERA COLLA!" COMPARE ALL THE COLOR THEORIES FROM NEWTON TO CHURCH-OSWALT INCLUDING "RGB." A "REAL COLOR WHEEL" WITH TRUE PIGMENT COLOR SCALES AND OPPOSITIONS. LEARN ABOUT SPLIT-COMPLEMENTARY OPPOSITIONS AND WHEN TO USE THEM. 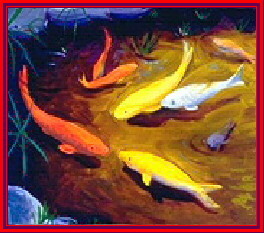 ON THIS SITE IS AN EXPLANATION OF RAINBOWS, COLOR PRISMS, CRYSTALS AND THEIR COLORS. AIR IS LIKE A SOFT CRYSTAL. A COMPOUND THAT DISPLAYS HARD CRYSTAL FEATURES. THE LATEST PAGES ARE TEACHING BUON FRESCO. Here is the Full Color Course, All About Color. Here's the Real Color Wheel. Go to the Indexed Site Tree. Very handy. New window.